Brick walk-out ranch with incredible space! Two living areas in one! The inviting main level boasts 3 bedrooms, formal living and dining room, an added bonus is the spacious sun room that is not included in the sq. footage, and 1.5 baths. The finished walkout basement adds another complete living space with full eat-in kitchen that walks out to side patio, two full baths, living room that walks out to covered patio, family room, dining area, bedroom with window, and a non conforming bedroom (no egress window). 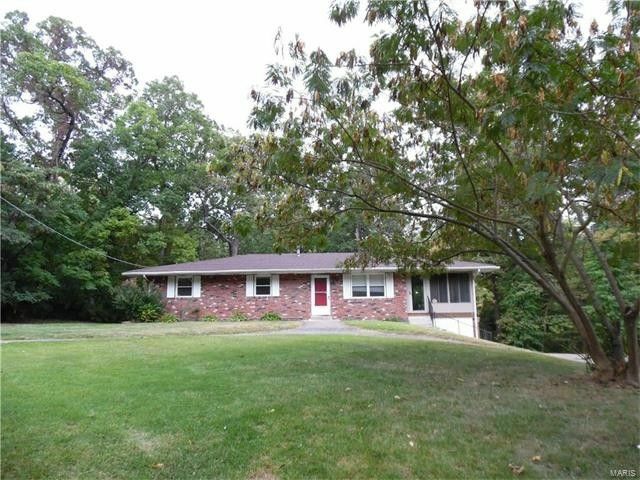 The sliding glass doors look out to the peaceful, wooded acreage behind the home. Plenty of parking with driveways on both sides of home and circle drive in front. Need space for cars, a hobby, or storage? The 32' x 23' aluminum storage unit with concrete floor is perfect! A must see! Home is perfect with mother-in-law quarters or extended family. All information including, square footage, lot size, school district, etc. to be verified buyer.